Making new friends sounds like such an easy thing to do, but there are times when it’s actually one of the hardest things we tackle as adults. There have been several periods in my life when I’ve felt so lonely and no matter how hard I tried to meet new people and make friends, it seemed like I just couldn’t “click” with anyone, even at church. While I loved hanging out and having fun with friends, I also craved connecting with others on a deeper level. I wanted friendships with people who enjoyed talking about personal struggles and personal growth, who wanted to pray together and encourage each other, and who were seeking spiritual growth in their own lives and wanted to share that growth with others. I wanted to be able to be open and share my own struggles and how God was growing me, and I wanted friends who felt comfortable sharing the same thing with me. Thankfully, through prayer and through the Lord’s provision, I now have several close friends in my life who enjoy having deep talks and who want to pray together and encourage each other. I do have to admit that these friendships came about in unexpected ways; God connected me with people I didn’t see coming in ways I didn’t see coming, and He taught me a lot about genuine friendship through the process. So if you’re craving deeper Christian friendships, I’d like to share a few things I’ve learned about the whole friendship-making process. As I mentioned above, the Lord brought some friendships into my life that I didn’t see coming, and these friendships look very different than what I’d imagined because they are all long distance. I wasn’t expecting God to connect me with friends on the other side of the world, but that’s exactly what He did, and I couldn’t be happier with the amazing people He’s brought into my life. If you’re seeking new friends, be open to how God may provide them. That one Facebook friend who’s always leaving encouraging comments? Maybe ask her if she’d like to have a Skype date sometime. That person from your church who moved to a different city? Reach out and see how they’re doing. They might need a friend too! Of course, God may have friends waiting for you right where you’re at, so don’t be afraid to invite the new member in your small group for a coffee date or ask your coworker to have lunch together. Be open to how God may connect you with new friends! It can be challenging to create new friendships, even more so as an adult; therefore one of the key factors in making new friends is being intentional. Life gets busy, and if you’re trying to invest in a new relationship, especially if it’s long distance, then both friends will need to invest their time and energy to develop a connection and stay in touch. Make plans to talk or hangout. Keep your plans to talk or hangout. Share your own deeper thoughts, ideas, feelings, experiences. Once you and your new friend develop a deeper connection and a pattern of staying in touch and/or hanging out, staying close will become easier. While you’ll still have to intentionally maintain the friendship, it won’t require as much effort as it did when you were getting to know each other. Note: I know from experience that sometimes, the person you’re trying to befriend won’t always respond. They’ll ignore texts, “forget” dates, or cancel frequently. I also speak from experience when I lovingly say: Move on. The other person may be a great acquaintance, but they’re obviously not interested in the type of close friendship that you want, so it’s best to save your time and energy for someone who is equally invested in the relationship. This tip may sound cliche, but it’s so easy to try to impress or please a new friend when you’re getting to know each other. Saying you love pizza when you don’t, sitting through a movie you hate, agreeing to anything you’re not comfortable with or don’t enjoy - all of these things are starting off the friendship with a false impression of who you are and what you enjoy. Being yourself is really the best way to attract an ideal friend because they’ll either enjoy the same things you do, or they’ll appreciate how different you are from them, and they’ll want to get to know you and your interests and hobbies. Obviously, prayer is so very important in making new friends as a Christian. God knows your heart, and He knows what you need. Ask Him to connect you with some other Christians who would be a great match for you. Just remember He may connect you in unexpected ways, so watch out for new opportunities to make friends and prayerfully put yourself out there to make new friends! 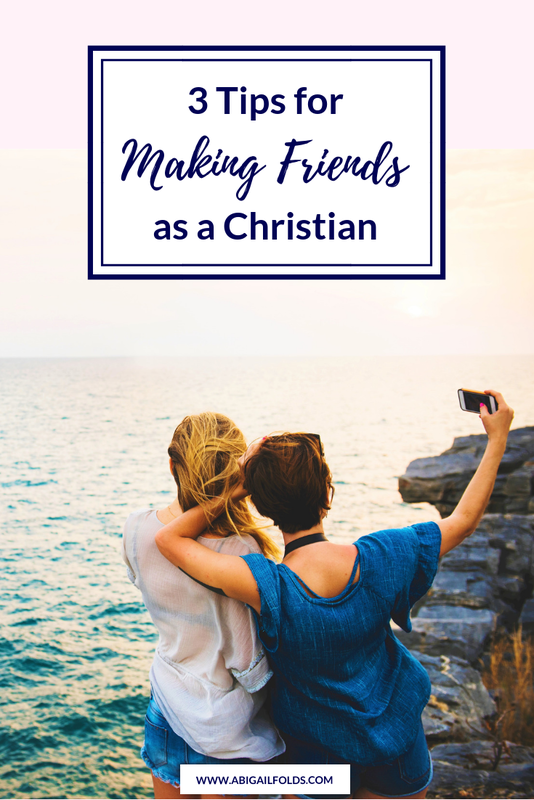 I hope this post gave you some ideas about making new friends as a Christian. Which tip was most helpful? Let me know in the comments! P.S. - New around here? Hi! I'm Abigail, your real-talk Christian life coach and faith mentor. I believe we're on this earth for a reason, and I LOVE helping people realize and own that truth so that they can reach their God-given potential in all areas of life. Let’s be friends on Instagram or Facebook! If you’re ready to move forward in your season and you’d like a mentor to support you along the way, then click the button below to learn how we can link arms on your journey!